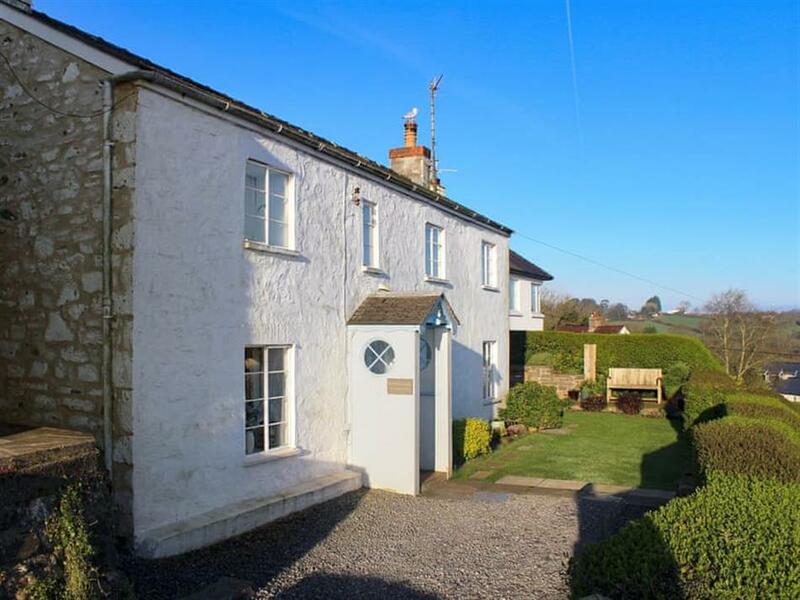 St Brides Cottage in Saundersfoot, Pembrokeshire sleeps 6 people. St Brides Cottage in Saundersfoot has thick stone walls and beamed ceilings; St Brides Cottage is nestled on St Brides Hill above the fishing village of Saundersfoot. 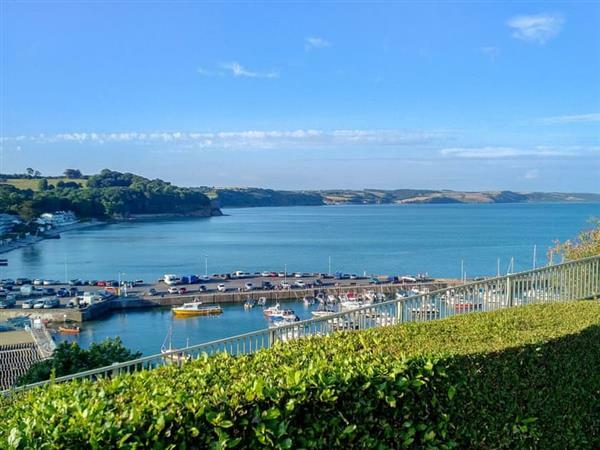 It is fitted out to a good standard and has one of the best views in Pembrokeshire - across Saundersfoot, the beach, the harbour and Carmarthen Bay. You will enter through the entrance porch and hall. Off the hall is a useful ground floor shower room and toilet. The living room and dining room have wonderful views. The well-equipped galley kitchen overlooks the garden and links to the sunny conservatory. Upstairs there are three bedrooms and a bathroom. The king-size and double bedrooms have panoramic views to enjoy in the morning. There is a bunk bedroom for two children. The upstairs bathroom has a bath, walk-in shower, toilet and basin. The front garden and terrace overlook the bay and the beach. The terrace is a wonderful place to sit and enjoy a drink and a bite or take a quiet afternoon nap in the sun. The rear garden is sloping. There are stone steps and retaining walls in the garden and unguarded drops of about three feet. The garden is reasonably secure but it is always sensible for children and pets to be supervised. There is off road parking on the private drive (for two cars) which is accessed off St Brides Hill. The gateway to the drive is wide enough for family cars (9 feet). To leave by car you reverse out onto St Brides Hill and because the drive is situated on a corner you will require assistance. The amenities of Saundersfoot, with good restaurants, pubs and cafés, are about 100 yard walk down St Brides Hill. The long sandy beach is accessible directly from the village and has bathing and magical rock pools to explore. The harbour is directly below the cottage with fishing and leisure boats and the Saundersfoot Sailing Club. From St Brides Cottage you can explore the 186 miles of the Pembrokeshire Coast Path, with rugged cliffs, sublime beaches, tranquil coves and the vast array of wildlife. A short drive away are the historic towns of Tenby, Narberth and Pembroke. Locally are a host of activities for all ages, including Folly Farm Zoo, Wales’ largest zoo complete with lions, rhinos, giraffes and even penguins. For thrill seekers, visit Oakwood Theme Park with one of Europe’s largest wooden rollercoasters. For those rare rainy days, take a visit to Hangar 5, a large indoor trampoline centre near Haverfordwest where your children can burn off some energy. The owners have been letting St Brides Cottage for many years and pride themselves on making your stay as enjoyable as possible. The owners are always available to contact by phone or email and there is a good local caretaker should you experience any problems during your stay. You will find the shop 100 yards from St Brides Cottage in Saundersfoot, with the pub and restaurant 50 yards from St Brides Cottage. Living room: With wood burner, 26 Freeview TV with BT Sports, DVD player, CD player, beams and slate floor. Kitchen: Galley style with electric oven, electric hob, microwave, fridge/freezer, dishwasher, washer/dryer and tiled floor. Bathroom: With bath, double shower cubicle and toilet. Gas central heating, electricity, bed linen, towels and Wi-Fi included. Initial fuel for wood burner included. Travel cot and highchair available on request. Enclosed lawned garden with patio and garden furniture. Private parking for 2 cars. No smoking. Please note: There are 7 steps, slopes and drops in the garden. Holidays at St Brides Cottage run from Saturday to Saturday. Pets allowed at St Brides Cottage. For a better idea of where St Brides Cottage is, you can see St Brides Cottage on the map below. St Brides Cottage is in Dyfed; should you be on the lookout for a special offer, you can find all the special offers in Dyfed. It's always worth checking to see what is on offer at the moment. Do you want to holiday near St Brides Cottage (UK10369), you can see other cottages within 25 miles of St Brides Cottage; have a look to find your perfect holiday location.